Summary: The Gary Redevelopment Commission has released a request for proposals (RFP) to redevelop 860 N. Lake Street, a 23-acre lakefront site adjacent to Lake Street in Gary’s Miller neighborhood. The public has the opportunity to submit questions and comments on the RFP until April 12th, 2019, before the RFP is formally released during the week of April 15th. Background: The City of Gary and Meridian Hospitality entered into a master development agreement in August 2017 that allowed the City to secure pre-plans from Meridian for redevelopment of Lake Street Beach, Miller TOD, and Aetna and Glen Ryan projects, but did not guarantee development rights. The conceptual design created by Meridian Hospitality raised concerns about inappropriate development, such as dune degradation by commercial and residential development and a shoreline structure that would prohibit sand flow. 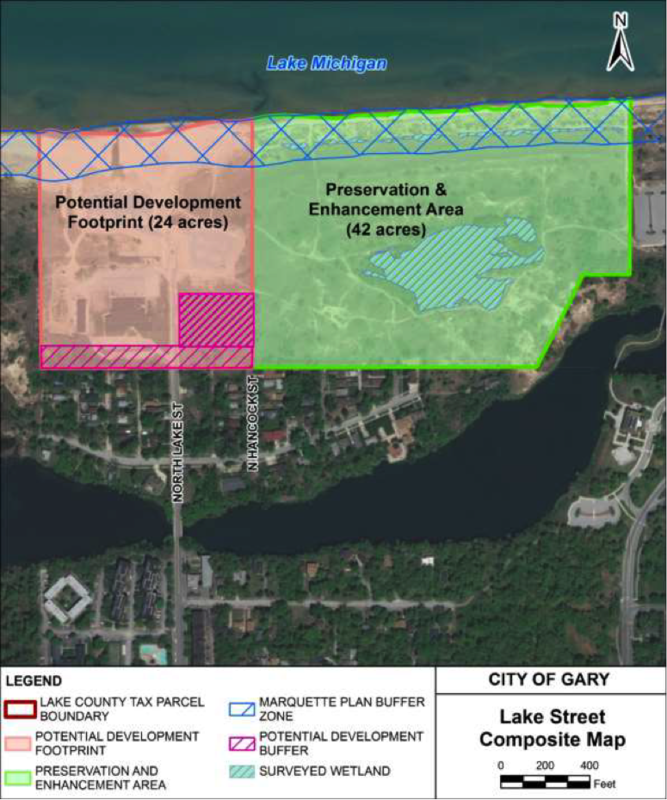 Save the Dunes and Gary residents voiced concerns about development plans that would destroy dune and wetland habitat, threaten access to Lake Michigan, and fail to match the needs and interests of the community. What’s Happening Now: The City of Gary is not bound to the preplans prepared by Meridian Hospitality, and has since updated the scope of work in the redevelopment RFP to scale back potential land uses of 860 N Lake Street. 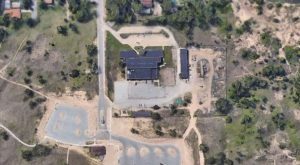 On March 12, the Plan Commission voted to subdivide the property, transferring the eastern 42 acres to the Parks Department for preservation. The eastern acres include panne (wetland) and dune habitat, as well as the Chanute Trail. The potential redevelopment footprint is now limited to the western 24 acres, with the exception of the shoreline and residential buffer and exclusion of a dune to the southeast. The Redevelopment Commission will seek requests for proposals to develop that property. Since the Meridian Hospitality design, Save the Dunes is happy to see the City incorporated comments regarding inappropriate land uses that threaten the dunes and integrity of the lakeshore and community into the RFP. We will remain engaged to ensure the spirit of preservation and public access is maintained throughout this process. According to the RFP, the Redevelopment Commission requests proposals with a focus on ecotourism, preservation of public access, protection of existing dunes and wetlands, attractive and responsible design, and community connectivity; we align with these objectives and will work with the City and community members to ensure the future plans for Lake Street shoreline reflect the ecological and recreational value of the region and complement the adjacent Indiana Dunes National Park. Next Steps: Save the Dunes is reviewing the RFP and will submit comments to the Redevelopment Commission. We will release those comments to the community before the comment period deadline of April 12th. In addition to written comments, Save the Dunes will meet with the City and partners such as the National Park Service to discuss potential opportunities as well as concerns. Timeline: Development proposals will be accepted by the Redevelopment Commission until June 5th, 2019, and will be opened at a public meeting shortly after. During the week of June 10th, the Redevelopment Commission will host responsive bidders at a public meeting to present their proposals, and on June 19th the project will be awarded at a public meeting. Following this process, we will remain active in subsequent public engagement phases, including site planning.